San Francisco has its share of amazing theater productions, but I have remained a theater virgin all these years that I've lived here. Even attending a college that shared a building with the Orpheum Theatre didn't nudge me to Wicked as it played there for over three years. 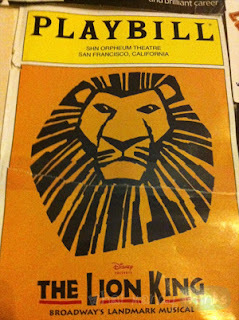 However, one particular visiting show wanted me to finally be rid of my theater virginity: the Lion King Musical! Lion King the Musical, for those who don't know, is based off the Disney animated version of The Lion King with a family of lions and one cub's journey through family drama and adulthood and all that junk with inspirational songs and hilarity. The musical version however is a puppeteer's dream with a truer African tribal feel than the bubbly cartoon. Amazing singing, dancing, songs, and the same script as the iconic cartoon it's based on make this a great show for all ages. Blah blah freakin' blah IT WAS SO AMAZING IT WAS... AHH! Pleeeeease go so it. And get some merch or at least keep the Playbill (duh). I got a mug because I'm a mug whore who has several and can't stop buying mugs. BUT AH ANYWAYS just go see it. I know this review is mostly me screaming and pulling adjectives out of the air but take my opinions to heart please! Eh, I'm just a broke 20-something who willingly forked over the cash to see a professional show but wishes stuff like this wasn't so freakin' EXPENSIVE! The seats I got were 85 bucks each. For a very popular musical, it wasn't hard to find a time and decent seat due to my in-advanced-ness purchasing tickets months in advance online. It was an afternoon showing so there were several children-related annoyances. Obviously, seeing this Disney animated version beforehand gives you an idea of what it's about and how it ends. This version added new songs and extra scenes that made the story as new and exciting as my first time with this story. - Just enough of "stay-the-same-ness" and "added-onto-original-to-make-it-unique-ness." The script is word for word, the jokes are the same, but what they added to it is simply extraordinary. - Speaking of additives, the puppeteering work... I mean what!! There's a cheetah that a guy walks in with crazy grace, a giraffe guy on stilts, the headpieces of the lions move over and above their heads depending on their reactions, it's all so imaginative. I'm running out of positive adjectives here, people. - The costumes were ahhhhh so well done. There's capes the lionesses wear during a hunting scene that are crazy cool. Even the grass people (yes there are people that are grass), the greens and foliage and all that, and their attitudes while in those costumes were like "HECK YES, I'm grass and PROUD OF IT." - Not as expensive as I thought it would be. Get to the websites as soon as you hear about it because tickets for this stuff go fast and the prices grow the longer you wait. - My only negative thing is literally stuff that has nothing to do with the show. It was an afternoon showing so children noises and bouncing little bodies made it not so perfect for my eyes and ears at times, but that's something I don't let ruin the show so NO BIG!